The present invention relates to hydraulic power generation systems and, in particular, to an apparatus and method for generating power using a novel pseudo-osmosis process which efficiently exploits the osmotic energy potential between two bodies of water having different salinity concentrations. Accordingly, it is an aspect to provide an improved apparatus and method for generating power using a novel forward osmosis process which efficiently exploits the osmotic energy potential between two bodies of water having different salinity concentrations. Advantageously, the method and apparatus of the present invention does not necessarily require the use of (but may use) a semi-permeable membrane or other specially formulated material, nor does it require heating or cooling of the fresh water or salt water solution. Moreover, the present invention may recover energy from a wide variety of fresh water sources, including treated or untreated river run-off, treated waste-water run-off or effluent, storm-drain run-off, partly contaminated fresh water run-off, and a wide variety of other fresh water sources. Thus, the present invention may be well suited, in one possible embodiment, to large scale power production in a wide variety of geographic locations and under a wide variety of conditions. The invention has particular advantage for use in remote regions where electrical power generation by conventional means may be commercially infeasible or impractical. According to one aspect of the invention, there is provided a mixing apparatus for mixing first salinity fluid with a second salinity fluid, the mixing apparatus comprising: a tube having a side wall, an open upper end and an open lower end, and a plurality of apertures selectively located in the side wall of the down tube; a fluid inlet and a fluid outlet at the open upper end and open lower end respectively of the tube, wherein the first salinity fluid in use enters the tube through the fluid inlet and is discharged therefrom through the fluid outlet; and a surrounding reservoir having a second salinity fluid having a salinity different to the first salinity fluid. According to yet another aspect of the invention, there is provided a mixing apparatus for mixing first salinity fluid with a second salinity fluid, the mixing apparatus comprising: a tube through which the first salinity fluid flows, the tube having a side wall and an open upper end and an open lower end, the tube having a porous screen tube, the tube being located in a container or tank which has flowing therethrough the second salinity fluid. In yet another aspect of the invention, there is provided a mixing apparatus for mixing first salinity fluid with second salinity fluid, the mixing apparatus comprising: a down tube having a side wall and an open upper end and an open lower end, the side wall being comprised of a meshed screen portion and solid portion below the meshed screen portion; a fluid inlet and a fluid outlet at the open upper end and open lower end respectively of the down tube, wherein the first salinity fluid in use enters the down tube through the fluid inlet and meshed screen portion and is discharged therefrom through the fluid outlet; a feed tube having a first end connectable to a source of second salinity fluid having a salinity different to the first salinity fluid and a second end for introducing second salinity fluid to the fluid inlet of the down tube to mix the first salinity fluid with the second salinity fluid to form a fluid mixture. Figure 2 is a schematic view of a hydrocratic generator in accordance with one aspect of the present invention. In Figures 1(a) and 1(b) of the drawings, there is shown a prior art apparatus and procedure for osmosis. Figure 1(a) shows the apparatus at the start position while Figure 1(b) shown the apparatus at the end position. The osmosis device 10 comprises trough 12 having a base portion 14 and a pair of lateral upright portions 16 and 18. A fluid 20 including NaCl is placed in the device. The base portion 14 has about midway along its length a semi-permeable membrane 22 through which osmotic flow of the liquid, which is water, will flow. In Figure 1(a) of the drawings, the start position, it will be seen that the level 26 in the upright portion 16 is substantially the same as the level 28 in the upright portion 18. As the process of osmosis progresses, with diffusion across the SMP 22, the level 26 rises and the level 28 drops in the upright portions 16 and 18 respectively. These figures illustrate the typical osmotic effect, which is able to release energy. Reference is now made to Figure 2 of the drawings showing one aspect of the present invention. Figure 2 of the drawings shows a hydrocratic generator 40, a device which is capable of using two liquids each having a different water potential to generate power or do some selected work requiring energy input. The hydrocratic generator 40 comprises a reservoir or effluent tank 42 which comprises a base 44 and side walls 46 which together define a space 48. The tank 42 has an inlet 50 through which effluent or other water type is introduced into the tank 42. The effluent fills the tank 42 and may eventually overflow when the tank 42 is full through an outlet or over the rim 52. There is thus a constant flow of effluent working its way through the tank 42. A pipe or tube 56 is passes through the tank 42 as shown in the Figure 2 of the drawings. The tube 56 has an upper end 58 and a lower end 60, both of these ends extending beyond the periphery or limits of the tank 42. The tube is comprises at least in part of a porous screen 62 which allows for diffusion of liquid between the liquid in the space 48 and liquid flowing through the interior 62 of the tube 56. Brine flows from the upper end 58 of the tube 56, through the interior 64 of the tube 56 and out through the lower end 60. 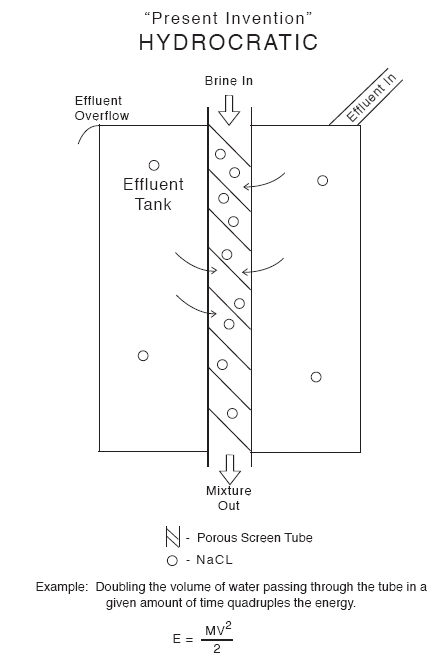 As brine flows through the tube 56 and effluent flows through the tank 42, the porous screen 62 allows for the necessary exchanges and interactions between the effluent and the brine and the different osmotic potentials between these liquids is exploited to harness power or energy. The power or energy may be used or stored in various manners which will not be specifically described herein. However, there are many different mechanisms for using or storing this energy and any one or more of these falls within the scope of the present invention. In one aspect of the invention, the flow produced is one whereby the effluent in the tank is able to pass through the porous screen 62 and mix with the brine. As such, brine is introduced into the tube 56 at the upper end 58 and a mixture of brine and effluent is discharged from the tube 56 at the lower end 60. In a pipe with a fixed diameter that is filled with a liquid, if the quantity of liquid flowing through that pipe is increased, the velocity of the liquid increases. The square of this increase is the increase in the Kinetic Energy of the liquid. The invention covers the use of different tank shapes, or even surrounding ambient water, and different tubes which may be configured and selected to optimize the flow and energy generated in a given situation, given the different types of water and their differing water potentials. When solvent fluids having differing osmotic potentials are contacted and mixed with each other energy is released. This released energy results from an increase in entropy of water (or other solvent) when it is transformed from its pure (fresh-water) state to its diluted (salt-water) state. Thus, an entropy gradient is created whenever two bodies of water or other solvents having differing solute concentrations are brought into contact with one another and begin to mix. This entropy gradient can be physically observed and measured in the well-known phenomena known as osmosis. Because the term “osmosis” is associated with a membrane, the term “hydrocrasis” is used as a term for the situation when solvent fluids having differing osmotic potentials are contacted and mixed with each other in the absence of a membrane. During testing of an upwelling device it was discovered that the amount of upwelling flow achieved in terms of kinetic energy of the overall mass flow was in excess of the input energy into the system in terms of the buoyancy effect and kinetic energy resulting from the water introduced into the tube. Subsequent experiments using a modified upwelling device have confirmed that the total hydraulic energy output of such system significantly exceeds the total hydraulic energy input. In one possible embodiment, fresh water is introduced into the tube in order to power the device. The term “fresh” water as used herein is to be interpreted in a broad sense as water having an osmotic potential relative to sea water. Thus, it may be used to describe the input stream a river discharge, a mountain run-off, a treated sewage discharge, a melting iceberg, or even runoff from a city storm drainage system. The fresh-water input stream may be conducted though the tube by applying pressure at the inlet end of the tube. The pressure may be provided by a pumping station or with a hydrostatic head pressure resulting from a fluid reservoir at a higher elevation. The pressure applied at the inlet end of the tube need only be high enough to overcome the hydrostatic head at the outlet end of the tube. It has been found that, when fresh water is introduced into a down tube, sea water flows into the up tube, causing upwelling in the up tube that can be used to generate power with the power generator. Some of this upwelling effect is due to the increased buoyancy of the mixed water in the up tube, because fresh water has a lower density than sea water. However, far more upwelling of sea water is observed than would be expected from this phenomenon alone. It is believed that the apparatus and the method is able to harness the energy available from the different osmotic potentials of fresh water and sea water. The amount of upwelling and the amount of power that is generated in the device depend in part on the particular dimensions of the tube and the flow rate of fresh water in the down tube. In operation in accordance with one aspect of the invention, fresh water exiting the down pipe through the radial apertures is mixed with water of higher salinity. The energy produced by the mixing of the water of higher salinity and lower salinity drives turbines. In the preferred embodiments discussed above, the tube is located in a body of water of high salinity and high negative osmotic potential such as an ocean or a sea. Alternatively, the invention can be operated between bodies of salt water having different salinity or between waters at different depths of the same body of water. For example, the salinity and temperature of sea water is known to vary with depth and location. While the present invention is disclosed, in one embodiment only, in the context of generating power by directly contacting and mixing fresh water with sea water in an apparatus located in the ocean, it is to be understood that the apparatus and method are not limited to this embodiment. The techniques and concepts taught herein are also applicable to a variety of other situations where aqueous solutions having differing osmotic potentials are available. For example, in one embodiment, the apparatus and method may be applied to a concentrated brine from a desalinization plant being mixed with the less-concentrated brine in sea water. In another embodiment, a treated sewage effluent, a fresh water stream, can be mixed with sea water. 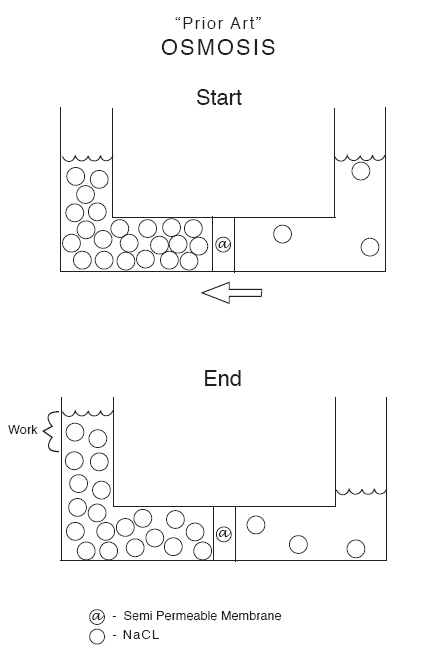 If desired, an osmotic membrane or osmotic water exchange plenum may be provided at the outlet end of a down tube and/or at the outlet (top) of the up tube in order to increase the efficiency of energy production. The apparatus and method may thus be applied to a wide range of applications in which two solutions of differing osmotic potential are available. The various embodiments of the invention disclosed and described herein are exemplary only. As such, these example embodiments are not intended to be exhaustive of all possible ways of carrying out the invention or even the most economical or cost-efficient ways of carrying out the invention on a commercial scale. Accordingly, it is intended that the scope of the present invention herein disclosed should not be limited by the particular disclosed embodiments described above, but should be determined only by a fair reading of the claims that follow.